Soybeans, soymeal and soyoil closed marginally higher. Wheat closed higher. Corn closed lower. USDA Jan and Feb numbers came and went without much trade action. Soybeans closed 1 cent. 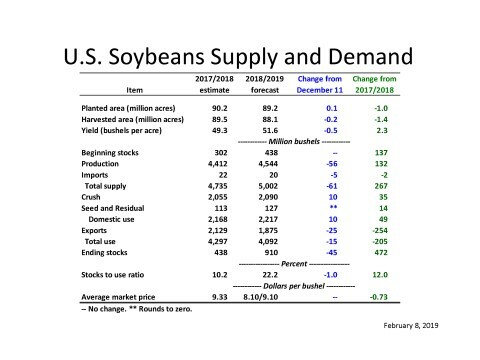 USDA lowered US 2018 soybean crop 56 mil bu. Yield was 51.6 vs 52.1 previous. USDA then lowered exports 25 mil bu and raised the crush 10 mil bu. The net was a drop of 45 mil bu in the carryout to 910. This is not the 1,000 mil bu feared but still a record. USDA average Farm price is near 8.60 vs 9.33 last year. Higher crush raised US 2018/19 soyoil carryout 180 mil lbs to 2,095. USDA lowered World soybean carryout to 106.7 mmt vs 115.3 previous and 101.3 last year. Increase in Brazil and China could not offset the drop in US and Argentina. Brazil 2019 soybean crop is now est near 117.0. China imports were lowered 2 mmt to 88.0. Corn futures closed lower. Some of the speculative longs were disappointed in the USDA Feb numbers. 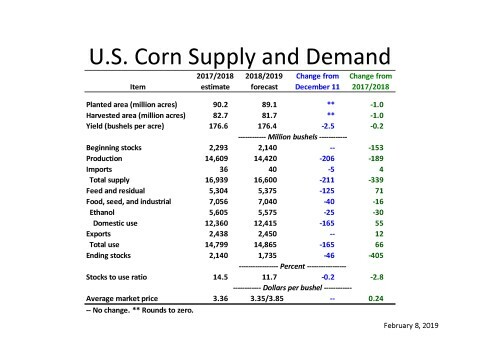 USDA lowered US 2018 corn crop 206 mil bu. Yield was 176.4 vs 178.9 previous. USDA then lowered the residual 125 mil bu and ethanol demand 25 mil bu. The net was a drop of 46 mil bu in the carryout to 1,735. USDA average Farm price is near 3.60 vs 3.36 last year. USDA raised World corn carryout to 309.8 mmt vs 308.8 previous and 340.8 last year. Increase in Argentina offset the drop in US. Of the 309.8, China is 207.8. Trade will now be watching World economy, US economy, any news from Washington especially on trade and 2019 weather. Talk of higher World 2019 corn supply could limit the upside and could encourage a slow trend lower….unless there is a good China trade deal that includes more US farm imports. Chicago and MLS March wheat closed higher. KC closed lower. USDA lowered US 2018/19 wheat feed use 30 mil bu and seed 6. The net was an increase of 36 mil bu in the carryout to 1,010. USDA average Farm price is near 5.25 vs 4.72 last year. USDA estimated US 2019 winter wheat acres near 31.3 million versus 32.1 expected and 32.5 last year. USDA lowered World wheat carryout to 267.5 mmt vs 268.1 previous and 280.0 last year. Increase in Russia could not offset the drop in China. Trade will now be watching World economy, US economy, any news from Washington especially on trade and 2019 weather. 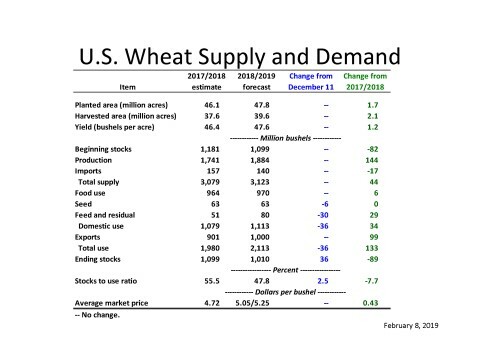 Talk of higher World 2019 wheat supply could limit the upside and could encourage a slow trend lower….unless there is a good China trade deal that includes more US farm imports. News that Egypt bought US SRW helped Chicago futures.